A small suburb of Brazzaville in Congo has become an unlikely style capital, thanks to its dedicated followers of foppish fashion. Dressed to the nines in bowler hats and tailored suits, a group of cigar-wielding ‘sapeurs’ have been strutting their stuff through the shanty town – and on to the pages of a glossy new book, Gentlemen of Bacongo, by Italian photographer Daniele Tamagni. Le Sapeurs, as they’re called, wear pink suits and D&G belts while living in the slums. Whether it be spectacles or bow tie accessories are very important for the sapeur, setting him apart from the less sartorially savvy crowd. 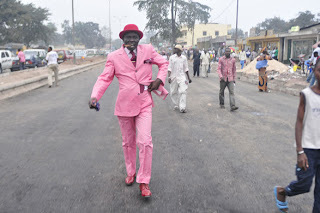 See also: Brazzaville, Congo, italian photographer, pink suits, shanty town, Style, suburb. See also: Bespoke Tailor, Brazzaville, Congo, Gentlemen of Bacongo, italian photographer, pink suits, Savile Row Suits, shanty town, Style, suburb, Suits. suburb Archives - Bespoke Suits By Savile Row Tailors.